The Kemei KM-6903 Rotary Electric Rechargeable Shaver with double floating shaving system.Triple individual floating heads that shave much more comfortably and thoroughly, because the triple shaving tracks offer more shaving surface for fast and a close comfy shave. The shaver follows your facial contour well and works on beards of any length or growing directions so that it does not even suggest the occurrence of ugly painful nicks while shaving. Shaver also flaunts a pop-up trimmer for precise detailing and is absolutely ergonomic in design so that you get the proper grip while you’re shaving progressively closer. And it’s absolutely easy to clean, just run the shaver over a tap of running water to clean or rinse. This charmer is compactly perfect to carry along with you while travelling. For long lasting and durable performance this rechargeable men’s rotary shaver makes a perfect gift. 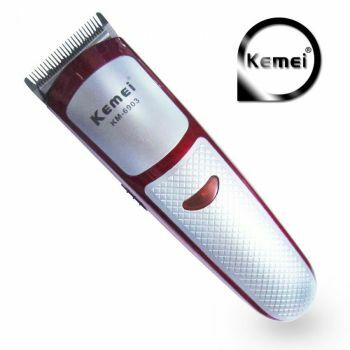 You are looking Buyteleshop.com now latest Kemei Professional Hair Trimmer Shaver KM-6903 22/04/2019 price in Pakistan market 2018 including in all major cities of Pakistan,Kemei Professional Hair Trimmer Shaver KM-6903 Price in Karachi, Kemei Professional Hair Trimmer Shaver KM-6903 price in Lahore ,Kemei Professional Hair Trimmer Shaver KM-6903 in Islamabad, Sialkot, Faisalabad, Peshawar, Quetta, Multan, Rawalpindi,Sialkot,hyderabad, and many more cities.